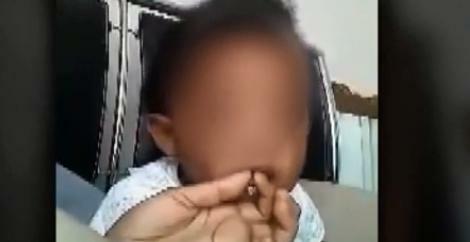 RALEIGH, N.C. -- A video of an infant smoking a small cigar set off outrage on social media that helped North Carolina authorities identify and arrest the mother. Police say the Raleigh mom had her baby smoke "a marijuana blunt," according to arrest warrants obtained by CBS affiliate WNCN. A version of the video that's received 1.5 million views was posted by a user who urged the mother's arrest. The 10-second clip shows the hand of an adult off-screen holding what appears to be a cigarillo to the child's lips. The child then makes a cooing sound and appears to inhale before letting out a puff of smoke. The Raleigh Police Department said Wednesday that the child was safe and the mother was in custody. "Big thanks to everyone who posted information about the smoking mother and baby," department officials told their Facebook followers in a post. "Thanks to your willingness to get involved, the child is now safe and the mother is in police custody." Police spokeswoman Laura Hourigan confirmed in an email that officials were referring to the child seen in the video. It wasn't immediately clear what substance the child was smoking, but the mother was charged with marijuana possession. Brianna Ashanti Lofton, 20, was also charged with two counts of felony child abuse, according to a police news release. The baby was placed with the county's child protective services department. A phone listing for Lofton couldn't be found through a public records search. "I was totally flabbergasted over the simple fact that I saw that baby smoking," neighbor Sean Price told WNCN. "The bad thing about it is I've seen that baby, said hi to the baby, touched that baby, because I have a little daughter of my own, so I interacted with her." While police said multiple Facebook users alerted them to the video Wednesday morning, the account holder whose posting was seen by more than a million people said he's glad the child is now safe. The user, who identified himself as Rasheed Martin of Rochester, New York, said he hasn't spoken directly with police, but he's satisfied that he helped raise awareness. His post prompted numerous comments by people worried about the child or upset with the mother. Martin said he doesn't know the mother and first found out about the video when a friend shared it online. He said he wanted the woman to be held responsible, so he reposted the video while urging his followers to help identify the woman. "Once more and more people found out about this situation, they showed me a screenshot of her actual Facebook page," Martin said in in an online interview. "Then I later added it to the post so everyone could know exactly who ... did that to the poor little girl."